Dare Conference has been going for three years but this is the first year I’ve been able to attend. It seems unique among conferences in that it focuses on collaborative business culture from a digital/ geek standpoint. Founder Jonathan Kahn used to be a web designer, but he grew frustrated at the disconnect between espoused workplace values and the reality – and set up DareConf to bridge that gap. 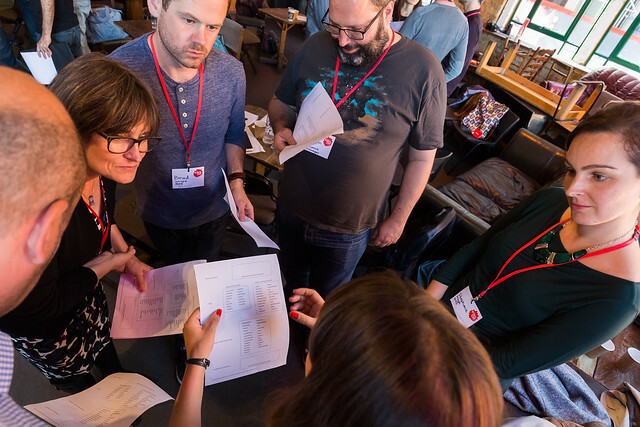 The first thing about DareConf is that it’s great for networking (in the best sense of the word): getting the chance to connect with like-minded people on a deeper level than you might do at a purely speaker-focused event. The conference is a mix of presenter-led talks and interactive workshops (like the one above). The excellent talks – where four people (Rifa Thorpe-Tracey, Laura Morgan, Penny Walker and Holly Burns) spoke about overcoming their own problems at work – set the tone for the interactive sessions. This entry was posted in Events and tagged #dareconf, active listening, business, business culture, collaboration, Dare Conference, Holly Burns, Instagram, Jonathan Khan, Laura Morgan, Paul Clarke, Penny Walker, Rifa Thorpe-Tracey, safe space, trust, values, workplace on September 30, 2015 by Jemima Gibbons. Game-changing companies Airbnb and Uber don’t own anything other than their online communities – and the data those communities generate. But Airbnb and Uber are worth billions. And they’ve blown traditional business models out of the water in the sectors in which they operate. This entry was posted in Events, Opinion and tagged Airbnb, business, business strategy, change management, data, Enterprise 2.0, Enterprise 2.0 Summit, social media, social technologies, Uber on April 28, 2015 by Jemima Gibbons. Should you use your personal Twitter account when starting a business? A friend of mine has set up a new business. It’s a modest operation at present and he’s the only employee. Should he create a new Twitter identity specifically for the business or should he switch the direction of his existing personal Twitter account? 2. If your business identity is closely aligned with your personality and values (as, in this day and age, it should) then you might as well be one and the same account, rather than “pretend” to be two completely separate identities. 3. If you’d like your business account to be along the lines of friendly, irreverent, informal but useful (and you’d be living in the last century if you didn’t), then you might as well keep it as the (hopefully) loveable person you already are, rather than struggling to find an informal “voice” as a non-human entity. 4. Yes, you may well loose some followers if you bang on about your business, but if your followers generally like you and you inject a reasonable amount of humour into things, any you loose will be those of least value to you. 5. If you want to be transparent and open in your business (as we all do, right? ), then Tweeting as your self rather than a third party really makes the most sense. This entry was posted in Uncategorized and tagged business, openness, Social business, social start-ups, transparency, Twitter on November 9, 2010 by admin.